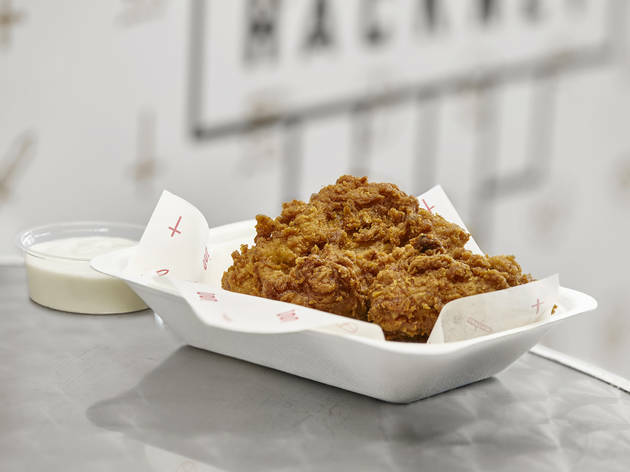 London’s first vegan ‘chicken shop’. 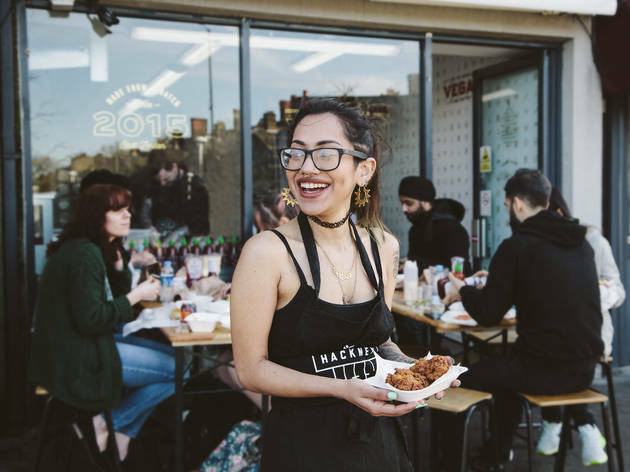 ‘Vegan chicken shop’ might be an oxymoron verging on the ridiculous, but it’s now a thing and it’s in Hackney (obviously). If you’re scoffing (and not in the stuffing-your-face sense) then stop. It’s about time the meat-free crowd got a taste of one of the city’s greasy glories. 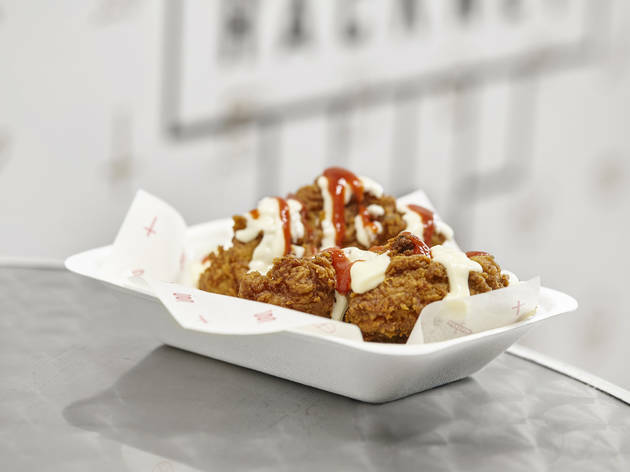 And say it quietly, but Temple of Hackney might even convince a few carnivores that delicious junk food doesn’t have to involve dead animals. This is the sequel to a street stall called Temple of Seitan – seitan being a meaty vegan substance made of wheat gluten. Moving to permanent premises, they’ve sadly ditched the pun, but what they’ve lost in Seitanic majesty they’ve more than made up for with a proper chicken shop-style atmosphere. There’s no indoor seating, no booze and plenty of bustle. It’s bright and spartan with blaring music and a rich, greasy smell. In fact it’s like every other chicken shop from Enfield to Croydon, except hipper, whiter and totally animal-product-free. The menu on the wall lists seitan served in various ways, plus gluten-free soya nuggets and vegan sides. If you’ve never tried seitan, it’s tougher than tofu, and chewier and less stringy than your average chicken wing – and of course bone-free. 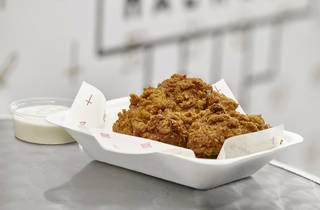 Since no sane person gets fried chicken for the high-quality meat anyway, the substitution is pretty irrelevant. What matters is the batter: it’s light, salty, peppery and moreish. 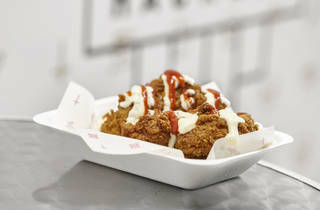 Served popcorn-style or in a sub with chilli sauce and vegan mayo, this totally hits the chicken spot. The roast roll – seitan, flavoured but not battered – was also a winner. Add zingy red slaw with parsley stalks or vegan mac’n’cheese with smoky seitan bacon cubes and you’ve got a properly delicious, not-at-all-wholesome dinner. This temple isn’t just for the vegan faithful. Hail, seitan! Dinner for two with drinks: around £20. The wait was worth it! 'Fried Chicken' Seitan sub rolls, roast 'beef/chicken'and pop 'chicken'...this is a vegan's heaven! 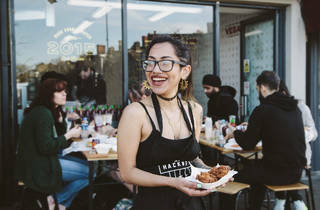 Crispy, full of flavour and in a unique location- I loved grabbing a bite from Temple of Hackney on Saturday. No matter what your food preferences are this is a restaurant you must try!! It does get extremely busy and has a lack of sitting so best bet is to go on a sunny day and perch outside the store on the Hackney steps. Prepare yourself for a 15-20minute wait if you are going between 1-3pm. From the outside it looks like any chippy shop. But who’s in the know, knows this little place is indeed a temple, of vegan goodies. You can have what the meat eaters normally would have in a place like this: burgers, wings, nuggets, but all plant based. And pretty good! The portions are generous and a good value for money. I’d suggest sharing, as a whole box of ‘chicken’ nuggets it too much for one person to consume in one go. The nuggets (popcorn bites) had perfect batter but were missing any kind of sauce the other dishes are served with. As for the drinks, they serve karma cola, super delicious natural drink along other canned sodas. Shame they only have four seats inside. Great concept for Vegan food. However they really need proper seating and the wait times can be particularly long. Food is average. Sweet Vegan Dreams Are Made Of this! Who Am I to disagree...... Seriously ... I wasn't expecting much..flavour wise,texture wise and even visually. My oh my was I blown away!! The vegan chicken burger with vegan bacon and cheese was literally to die for!! At no point did I tastes artificial preserves or false flavourings,which was a pleasant surprise! Then the chicken wings were just delicious! Tasted exactly like buffalo wings minus the bones! The best part was that it was all so inexpensive!! Theres very little seating outside so dont go with a group of friends thinking you'll all be seated .. Its a casual spot .. Mainly takeaway to be honest . with just a few spots alfresco for those who can't wait to devour the good stuff at home. I highly recommend this place to both meat eaters and vegans alike! So worth the journey! One of my biggest regrets in life is that I became vegetarian too early on and never tried fried chicken - many times I've jealously watched my drunk friends go crazy on it and could never find out what the fuss is all about. Until now, of course - thanks to Temple of Hackney. Their chick'n is made from seitan, one of my favourite veggie meat alternatives. It's very easy to overdry seitan, but the team at ToH knows what they're doing! I have to give props to this place for making fake chicken taste like chicken. The texture is great the flavour is great and it's super filling. What more could you ask for! The sauce on the burgers eveb tasted like your standard mayo. GI vegans of 2017! I recommend this for a nice little lunch well actually a big lunch really. Golden and delicious chips as well which are ready so quickly so you don't have to wait long at all! I am not a vegetarian but places like this make me consider it! What's next? 0 calorie fries! Let's hope so! Thank you for the good food and I hope others try it out, be it veggie or not veggie!